Lathes go back in history over 3,000 years. Evidence of lathes have been found going back to 700 B.C.E. There were even illustrations of lathes in Egyptian tombs dating back to 300 B.C.E. Lathes are used in woodturning, metalworking, metal spinning, and glassworking. A lathe used for working with clay is more commonly known as a potter's wheel. Most suitably equipped metalworking lathes can also be used to produce most solids of revolution, plane surfaces and screw threads or helices. Ornamental lathes can produce three-dimensional solids of incredible complexity. The material is held in place by either one or two centers, at least one of which can be moved horizontally to accommodate varying material lengths. Examples of objects that can be produced on a lathe include candlestick holders, cue sticks, table legs, bowls, baseball bats, crankshafts and camshafts. 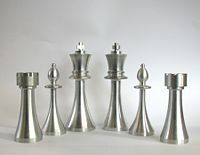 Chess pieces shaped with a lathe. Cue lathes function similar to turning and spinning lathes allowing for a perfectly radially-symmetrical cut for billiard cues. They can also be used to refinish cues that have been worn over the years. Glassworking lathes are similar in design to other lathes, but differ markedly in how the workpiece is modified. Glassworking lathes slowly rotate a hollow glass vessel over a fixed or variable temperature flame. The source of the flame may be either hand-held, or mounted to a banjo/cross slide that can be moved along the lathe bed. The flame serves to soften the glass being worked, so that the glass in a specific area of the workpiece becomes malleable, and subject to forming either by inflation ("glassblowing"), or by deformation with a heat resistant tool. Such lathes usually have two headstocks with chucks holding the work, arranged so that they both rotate together in unison. Air can be introduced through the headstock chuck spindle for glassblowing. The tools to deform the glass and tubes to blow (inflate) the glass are usually handheld. In diamond turning, a computer-controlled lathe with a diamond-tipped tool is used to make precision optical surfaces in glass or other optical materials. Unlike conventional optical grinding, complex aspheric surfaces can be machined easily. Instead of the dovetailed ways used on the tool slide of a metal turning lathe, the ways typically float on air bearings and the position of the tool is measured by optical interferometry to achieve the necessary standard of precision for optical work. The finished work piece usually requires a small amount subsequent polishing by conventional techniques to achieve a finished surface suitably smooth for use in a a lens, but the rough grinding time is significantly reduced for complex lenses. In metal spinning, a disk of sheet metal is held perpendicularly to the main axis of the lathe, and tools with polished tips (spoons) are hand held, but levered by hand against fixed posts, to develop large amounts of torque/pressure that deform the spinning sheet of metal. Metal spinning lathes are almost as simple as woodturning lathes (and, at this point, lathes being used for metal spinning almost always are woodworking lathes). Typically, metal spinning lathes require a user-supplied rotationally symmetric mandrel, usually made of wood, which serves as a template onto which the workpiece is moulded (non-symmetric shapes can be done, but it is a very advanced technique). For example, if you want to make a sheet metal bowl, you need a solid chunk of wood in the shape of the bowl; if you want to make a vase, you need a solid template of a vase, etc. Given the advent of high speed, high pressure, industrial die forming, metal spinning is less common now than it once was, but still a valuable technique for producing one-off prototypes or small batches where die forming would be uneconomical. In a metalworking lathe, metal is removed from the workpiece using a hardened cutting tool, which is usually fixed to a solid moveable mounting called the "toolpost," which is then moved against the workpiece using handwheels and/or computer controlled motors. The toolpost is operated by leadscrews that can accurately position the tool in a variety of planes. The toolpost may be driven manually or automatically to produce the roughing and finishing cuts required to turn the workpiece to the desired shape and dimensions, or for cutting threads, worm gears, etc. Cutting fluid may also be pumped to the cutting site to provide cooling, lubrication and clearing of swarf from the workpiece. 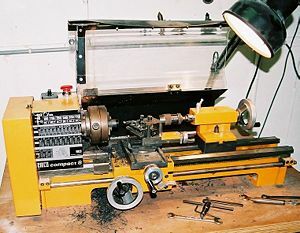 Some lathes may be operated under control of a computer for mass production of parts (see "Computer Numerically Controlled"). Metalworking lathes are commonly provided with a variable ratio gear train to drive the main leadscrew. This enables different pitches of threads to be cut. Some older gear trains are changed manually by using interchangeable gears with various numbers of teeth, while more modern or elaborate lathes have a quick change box to provide commonly used ratios by the operation of a lever. The threads that can be cut are, in some ways, determined by the pitch of the leadscrew: A lathe with a metric leadscrew will readily cut metric threads (including BA), while one with an imperial leadscrew will readily cut imperial unit based threads such as BSW or UTS (UNF,UNC). The ornamental turning lathe was developed around the same time as the industrial screwcutting lathe in the nineteenth century. It was used not for making practical objects, but for decorative work—ornamental turning. By using accessories such as the horizontal and vertical cutting frames, eccentric chuck and elliptical chuck solids of extraordinary complexity may be produced by various generative procedures. A special purpose lathe, the rose engine is also used for ornamental turning, in particular for engine turning, typically in precious metals, for example to decorate pocket watch cases. As well as a wide range of accessories, these lathes usually have complex dividing arrangements to allow the exact rotation of the mandrel. Cutting is usually carried out by rotating cutters, rather than directly by the rotation of the work itself. Because of the difficulty of polishing such work, the materials turned, such as wood or ivory, are usually quite soft, and the cutter has to be exceptionally sharp. The finest ornamental lathes are generally considered to be those made by Holtzapffel around the turn of the nineteenth century. A reducing lathe is a specialized lathe that is designed with this feature, and which incorporates a mechanism similar to a pantograph, so that when the "reading" end of the arm reads a detail that measures one inch (for example), the cutting end of the arm creates an analogous detail that is (for example) one quarter of an inch (a 4:1 reduction, although given appropriate machinery and appropriate settings, any reduction ratio is possible). Reducing lathes are used in coin-making, where a plaster original (or an expoxy master made from the plaster original, or a copper shelled master made from the plaster original, etc.) is duplicated and reducted on the reducing lathe, generating a master die. Woodworking lathes are the oldest variety. All other varieties are descended from these simple lathes. An adjustable horizontal metal rail - the tool rest - between the material and the operator accommodates the positioning of shaping tools, which are usually hand-held. With wood, it is common practice to press and slide sandpaper against the still-spinning object after shaping to smooth the surface with the metal shaping tools. There are also woodworking lathes for making bowls and plates, which have no horizontal metal rail, as the bowl or plate needs only to be held by one side from a metal face plate. Without this rail, there is very little restriction to the width of the piece being turned. Further detail can be found on the woodturning page. Watchmakers lathes are delicate but precise metalworking lathes, usually without provision for screwcutting, and are still used by horologists for work such as the turning of balance shafts. A handheld tool called a graver is often used in preference to a slide mounted tool. The original watchmaker's turns was a simple dead-centre lathe with a moveable rest and two loose headstocks. The workpiece would be rotated by a bow, typically of horsehair, wrapped around it. A lathe may or may not have a stand (or legs), which sits on the floor and elevates the lathe bed to a working height. Some lathes are small and sit directly on a workbench or table, and do not have a stand. All lathes have a "bed," which is (almost always) a horizontal beam (although some CNC lathes have a vertical beam for bed to ensure that swarf, or chips, falls free of the bed. At one end of the bed (almost always the left, as the operator faces the lathe) is a "headstock." The headstock contains high-precision spinning bearings. Rotating within the bearings is a horizontal axle, with an axis parallel to the bed, called the "spindle." Spindles are often hollow, and have exterior threads and/or an interior Morse taper on the "inboard" (i.e., facing to the right / towards the bed) by which accessories which hold the workpiece may be mounted to the spindle. Spindles may also have exterior threads and/or an interior taper at their "outboard" (i.e., facing away from the bed) end, and/or may have a handwheel or other accessory mechanism on their outboard end. Spindles are powered, and impart motion to the workpiece. The spindle is driven, either by foot power from a treadle and flywheel or by a belt drive to a power source. 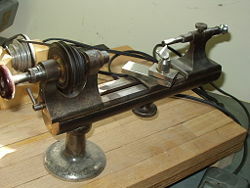 In some modern lathes this power source is an integral electric motor, often either in the headstock, to the left of the headstock, or beneath the headstock, concealed in the stand. Some Amish are known to purchase modern lathes, remove the electric motor, and then convert them to run via leather belts from an overhead line shaft. At the other end of the bed (almost always the right, as the operator faces the lathe) may be a tailstock. Not all lathes have tailstocks. A tailstock provides auxiliary support to the workpiece. Tailstocks are not powered. Metalworking lathes have a "cross slide," which is a flat piece that sits crosswise on the bed, and can be cranked at right angles to the bed. Sitting atop the cross slide is a toolpost, which holds a cutting tool which removes material from the workpiece. There may or may not be a leadscrew, which moves the cross slide along the bed. Woodturning and metal spinning lathes do not have cross slides, but have "banjos," which are flat pieces that sit crosswise on the bed. The position of a banjo can be adjusted by hand; no gearing is involved. Ascending vertically from the banjo is a tool post, at the top of which is a horizontal "tool rest." In woodturning, hand tools are braced against the tool rest and levered into the workpiece. In metal spinning, the further pin ascends vertically from the tool rest, and serves as a fulcrum against which tools may be levered into the workpiece. Unless a workpiece has a taper machined onto it which perfectly matches the internal taper in the spindle, or has threads which perfectly match the external threads on the spindle (two things which almost never happen), an accessory must be used to mount a workpiece to the spindle. A workpiece may be bolted or screwed to a faceplate, a large flat disk that mounts to the spindle. Alternatively faceplate dogs may be used to secure the work to the faceplate. A workpiece may be clamped in a three- or four-jaw chuck, which mounts directly to the spindle. In precision work (and in some classes of repetition work), cylindrical workpieces are invariably held in a collet inserted into the spindle and secured either by a drawbar, or by a collet closing cap on the spindle. Suitable collets may also be used to mount square workpieces. A soft workpiece (wooden) may be pinched between centers by using a spur drive at the headstock, which bites into the wood and imparts torque to it. A live center (top), and a dead center (bottom). A soft dead center is used in the headstock spindle as the work rotates with the center. Because the center is soft, it can be trued in place before use. The included angle is 60 degrees. Traditionally, a hard dead center is used together with suitable lubricant in the tailstock to support the workpiece. In modern practice the dead center is frequently replaced by a live center or (revolving center) as it turns freely with the workpiece usually on ball bearings, reducing the frictional heat, which is especially important at high RPM. A lathe carrier may also be employed when turning between two centers. In woodturning, one subtype of a live center is a cup center, which is a cone of metal surrounded by an annular ring of metal that decreases the chances of the workpiece splitting. A circular metal plate with even spaced holes around the periphery, mounted to the spindle, is called an "index plate." It can be used to rotate the spindle a precise number of degrees, then lock it in place, facilitating repeated auxiliary operations done to the workpiece. When a workpiece is fixed between the headstock and the tailstock, it is said to be "between centers." When a workpiece is supported at both ends, it is more stable, and more force may be applied to the workpiece, via tools, at a right angle to the axis of rotation, without fear that the workpiece may break loose. When a workpiece is fixed only to the spindle at the headstock end, the work is said to be "face work." When a workpiece is supported in this manner, less force may be applied to the workpiece, via tools, at a right angle to the axis of rotation, lest the workpiece rip free. Thus, most work must be done axially, towards the headstock, or at right angles, but gently. When a workpiece is mounted with a certain axis of rotation, worked, then remounted with a new axis of rotation, this is referred to as "eccentric turning" or "multi axis turning." The result is that various cross sections of the workpiece are rotationally symmetric, but the workpiece as a whole is not rotationally symmetric. This technique is used for camshafts, various types of chair legs, etc. The smallest lathes are "jewelers lathes" or "watchmaker lathes," which are small enough that they may be held in one hand. Although the workpieces machined on a jeweler's lathes are metal, jeweler's lathes differ from all other metal working lathes in that the cutting tools (called "gravers") are hand held, supported by a T-rest, not fixed to a cross slide. The work is usually held in a collet and two spindle bores to receive such collets are common, namely 6 mm and 8 mm. Two patterns of bed are common, the WW (Webster Whitcomb) bed, which is found only on 8 mm. Watchmakers lathes which is a truncated triangular prism and the continental D-style bar bed used on both 6 mm and 8 mm lathes by firms such as Lorch and Star. Other designs have been used, e.g. Boley used a triangular prism as bed on some 6.5 mm lathes, and IME used a V edged bed on their 8 mm lathes. Lathes that sit on a bench or table are called "bench lathes." Lathes that do not have additional integral features for the purposes increased production rates, but rather have individual part production or modification as the primary role, are called "engine lathes." Lathes with a very large spindle bore and a chuck on both ends of the spindle are called "oil field lathes." Fully automatic mechanical lathes, employing cams and gear trains for controlled movement, are called automatic screw machines. 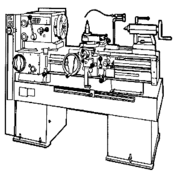 A lathe with a cylindrical tailstock that can rotate around a vertical axis, so as to present different facets towards the headstock (and the workpiece) are turret lathes. Various combinations are possible: e.g. one could have a "vertical CNC lathe," etc. Lathes can be combined with other mechanisms into more complex machines, such as those with an overhead drill or vertical milling unit. These are usually referred to as combination lathes. Holzapffel, Charles. 1897. Turning and Mechanical Manipulation Volume V.
This page was last modified on 21 June 2018, at 21:03.